Of late, consumers in India have become more data-centric, thanks to Reliance Jio’s free data services from the past six months. To catch up the trend, almost every telecom operator in India has been providing excellent data offers for their users. Starting from India’s leading telecom operator, Airtel to state-run telecom operator, everyone is into the data game now. When Reliance Jio first announced its public operations and tariff plans in September 2016, customers used to pay somewhere close to Rs. 250 for just 1GB of data. Not one operator, almost every player had the same plans and users have got used to it since ages. But, Jio changed the scenario completely with its dirt cheap tariff plans and free 4G services. If we consider the same scenario today, operators are charging almost same amount (little more), but offering 1GB data per day. Notably, Airtel is one of them. But, those offers are for prepaid consumers. Airtel is leading the postpaid segment in the country with its myPlan Infinity plans starting at Rs. 499. After the inception of Reliance Jio, Airtel has modified its myPlan Infinity schemes to match Reliance Jio’s plans. 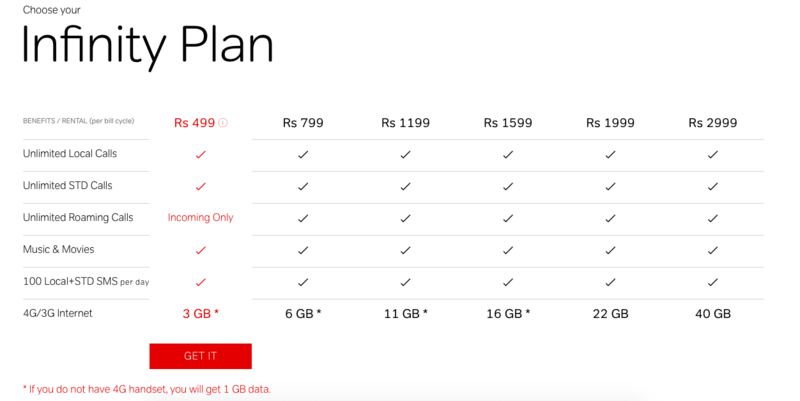 Airtel’s myPlan Infinity plans now start at Rs. 499 offering unlimited local and STD calls along with free roaming incoming calls. Most importantly, the plan comes with 3GB of data valid per billing cycle. The data benefit increases with the higher value packs. The Rs. 799 myPlan Infinity postpaid plan offers 6GB of data and the Rs. 1199 plan gives 11GB of 4G data. The Rs. 1599, Rs. 1999, and Rs. 2999 plans offer 16GB, 22GB, and 40GB respectively. Also, the data benefits will vary if you don’t have a 4G handset. If you consider the same plans in August 2016, they used to offer just 10 percent data than what they are offering now. For example, the Rs. 1199 plan was launched in August 2016 providing just 1GB 3G/4G data at its launch, but it now offers 11GB data, which is more than ten times. Also, the Rs. 1599 plan used to offer just 5GB 3G/4G data which now offers 16GB data per billing cycle. So, it’s clear that Airtel is luring consumers by providing better data than its rival operators. Speaking of which, Vodafone has its RED postpaid plans offering similar benefits but comes with less data proportion when compared to Airtel. What do you think of the Airtel’s myPlan Infinity postpaid plans? Let us know in the comments section below. I am a Airtel customer when I used prepaid 3G connection it was very costly. So I changed into post paid connection now Airtel doing good offers in prepaid connection. This is disappointing.